Dance ‘Til Dawn is the electrifying stage extravaganza from Strictly Come Dancing’s Vincent Simone and Flavia Cacace, two of the ITV show’s best loved dancers! The pair wowed audiences with their 2012 Olivier Award nominated dance show, Midnight Tango which ran in London’s esteemed Phoenix Theatre before embarking on a UK tour. Now back on the West End with their new show, Vincent and Flavia look set to impress live audiences once again with their new, Hollywood inspired dance show. Drawing from the Golden Age of Hollywood glamour, Dance 'til Dawn transports its avid audience to the 1940’s, with a loose plot involving a LA starlet, Sadie Strauss (Flavia) and her impossibly handsome lover Tony (Vincent) who is framed for a murder he did not commit…As the plot thickens, the pair’s dance moves become even more complex in a display of pure skill. Dance ‘Til Dawn promises to be an unforgettable experience; a truly glamorous evening to indulge all the senses. 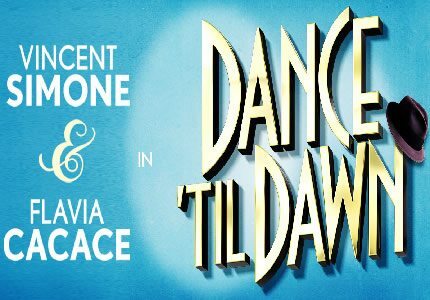 The cast of Dance ‘Til Dawn include Tanya Robb, Faye Best, Tyman Boatwright, Ivan De Fritas, Jamie Ray Hartshorne, Abbie Osmon, Annie Kitchen, Anna Woodside, Oliver Darley and more. Dance 'Til Dawn runs at the Aldwych Theatre from 23rd October 2014 to the 3rd January 2015 and promises to be a fantastic festive treat! Dance ‘Til Dawn contains some moderate adult themes but is, generally speaking, a non offensive, family friendly show.